When basketball historians look back on the 2007 NCAA Tournament, they will find that this particular March Madness was lacking something most usually have: a Cinderella. With this lack of a nationally captivating underdog story, only one thing comes to my mind: good riddance to Cinderella and her glass slippers. Now don�t get me wrong, I was just as impressed by George Mason as the next guy was last year when they made their historic run to the Final Four, but their matchup with eventual national champ Florida left much to be desired in terms of a good basketball game. This year, the case will be much different. When Florida, Ohio State, Georgetown, and UCLA meet up this weekend in Atlanta, it will be the first time since 1993 that the Final Four is comprised of only 1 and 2 seeds, and frankly I can�t wait. After a tournament that most people would consider less thrilling than in previous years, the final three games are shaping up to be absolutely fantastic, with all four teams having spent significant time in the SCS.com Fab 15 this year. There is no team here that simply got hot at the right time; each of these teams is among the elite in the country and has proven their worth in the tournament. What is most exciting about this year�s Final Four isn�t simply the battles between the teams, but the matchups that will be taking place within the two national semi-final games. While everyone may be watching the scoreboard for the final body of work from each team, I will be keeping my eye on matchups between upwards of ten players that could be calling the NBA home in a couple of years. This is the mother of all matchups this weekend. Not since Brad Daugherty of North Carolina and Patrick Ewing of Georgetown did battle in the 1982 National Championship game has there been a marquee match up of 7-footers in a Final Four like this one. Oden is the freshman phenom who has already been hailed as the next great franchise center in the NBA, and Hibbert is the massive but raw sophomore who has teamed with Jeff Green to form the best frontcourt duo north of Gainesville. Hibbert, at points in the season, was inconspicuous on the floor (as far as 7-footers go), not playing aggressive or calling for the ball on the post. He has come on very strong down the stretch though, culminating in a fantastic performance against North Carolina in the Elite 8. He played a great all-around game while being hounded by Tyler Hansbrough and Brandon Wright. The only point Hibbert got into trouble was with fouls, picking up his third very early in the second half. Oden changes the game just by stepping on the court. Defensively there is no more intimidating presence in the country, at points during the year seemingly taking away any shot inside the paint for opponents. Oden was a good offensive player when he was just playing with his left hand, but now has the use of his right as well, making him all the more dangerous in the post and on the offensive glass. Advantage: Hibbert, thanks to Green, his counterpart. The two will be too much for the youngster Oden to handle by himself, unless Ohio State breaks away from their perimeter based offense. Green, the Big East Player of the Year, can go inside and outside offensively, but is most effective with his mid-range game. At 6-9, an able ball handler, and a good shooter, he will certainly be a matchup problem for Ohio State. He has also shown as of late his ability to perform in pressure situations, with his game winning shot in the Sweet 16 against Vanderbilt, and his 22-point performance against North Carolina that put Georgetown into the Final Four. Keep in mind though, despite his athleticism and talent, Green is just one player. Ohio State has so much talent and so many weapons on the perimeter that they could have probably still won 20 games even without Greg Oden. The Buckeyes can call on Mike Conley Jr., Ron Lewis, Daequan Cook, and Jamar Butler to score points for them either going to the basket or from the outside. Conley has emerged as one of the nation�s top point guards, and is very crafty with the ball. Lewis and Cook are pure scorers and along with Butler, they can do serious damage from behind the arc. Advantage: Ohio State. While Green should have a good game offensively due to his huge size advantage on the Buckeyes� backcourt, he can�t cover everything Ohio State�s perimeter offense will be throwing at Georgetown on the other end of the floor. This matchup is your classic case of beauty and the beast. Florida�s frontcourt can lay claim to being the best in the nation, while UCLA�s big men get lost behind high profile teammates Arron Aflalo and Darren Collison. 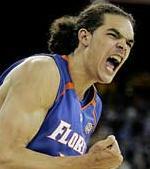 Noah and Horford are the anchor of the Gators, it�s as simple as that. Noah shows more heart and hustle than maybe any player in college basketball, and though his numbers this season haven�t always been spectacular, he has stepped up the most when it has counted. He�s coming off of his best performance of the tournament, going for 14 points and 14 rebounds in the Elite 8 against Oregon. Horford is simply just a physical presence to be reckoned with. He is so strong around the basket; add in his immense physical tools and his solid basketball IQ, and Horford is the perfect running mate for Noah down low. Mata and Mbah a Moute do what solid �role starters� are supposed to do, they play hard. Mbah a Moute is the more athletic of the two, able to step out and face the basket, while Mata is just there to bang players in the lane. Both go to the boards hard and play solid on the defensive side of the court, but they will never be mistaken for a tandem that will be looked upon to carry a team. Advantage: Noah and Horford. This is where the game could be won or lost for UCLA. The Bruins match up with Florida in terms of perimeter play, but the Gators feature two future first round NBA draft picks in their frontcourt. Noah and Horford are simply too good and too talented for Mata and Mbah a Moute to completely shut down both. How much fun is it going to be watching these two point guards go at it on Saturday? Collison may be the fastest player in college basketball (no offense Ty Lawson), and Green is no slouch with his first step either. Both guys just know how to direct an offense, and the only reason Green didn�t average better than his 3.6 assists on the year was because everyone on the UF roster plays such solid team-oriented basketball. Green is coming off a fantastic 21-point performance against Oregon in which he really got hot from the outside, showing his full shooting ability from behind the arc. He�s a very smart point guard, especially when it comes to deciding on game tempo. Green just seems to know when to push the ball, and when a half court set is more likely to work well for the Gators. Collison�s game is built on speed. He is a deadly shooter from the outside, but his ability to pull up in an instant in knock down mid-range jumpers is his most dangerous weapon offensively. He has great court vision on the break as well. Collison is probably even more effective on the other side of the floor, where he has emerged as one of the nation�s elite on-ball defenders, garnering plenty of steals and forcing turnovers due to his ability to stay in front of opponents and hound them. Advantage: Green. Both players match up fairly well and are even in many respects, but Green has the intangible advantage due to last year�s title game. Granted, Collison did play 20 minutes in that game, but it was coming off the bench to relieve Jordan Farmar. Green sparked the Gator offense thanks to 8 assists and just 1 turnover in helping Florida to victory.